Today is my step-daughter’s (Maddie) Sweet 16 birthday. She’s a wonderful young lady … beautiful (inside and out, which is the very best kind of beautiful), talented (acts, sings, draws, writes), witty (will keep you laughing), clever (that girl has got a mind of her own), and the gentlest soul you will ever know (but she once stood up to a gang of bullies who were taunting a special needs child at her school). I love celebrating her today! Anyway, getting back on track … like I said, I was up early to go buy donuts for the birthday breakfast, which had me obviously thinking about birthdays. And because I was up early, I also thought it would be nice to blog since I didn’t get around to that yesterday. 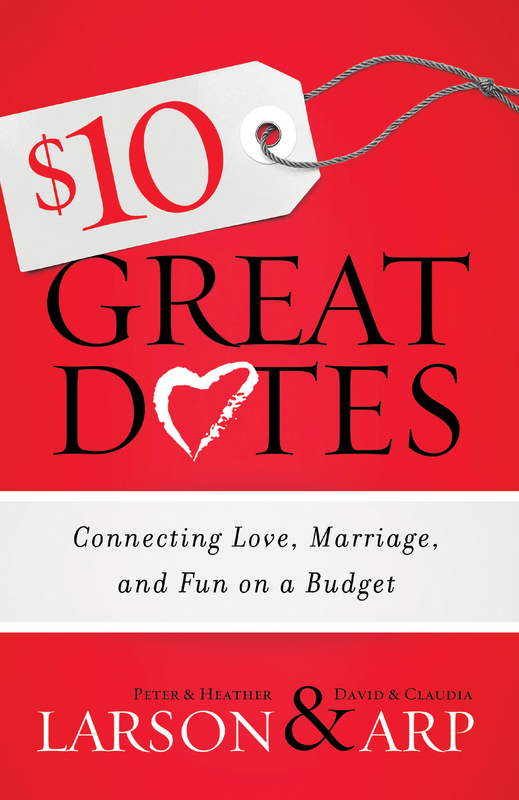 And since I am having a blog contest on great dates, I thought perhaps I could share about one of my personal great dates. And that’s when the idea popped into my head: I could share about The Great Birthday Date. Actually, I need to tell this story in two parts because “The Great Birthday Date” actually took place over two birthdays, back-to-back years. But I need to tell part two before I can tell part one … or at least that’s the order I want to tell it to you. Jon and I had been dating nearly a year when my 38th birthday rolled around. Now for those of you who don’t know, Jon and I met online (yes, we are one of “those” couples) and had a long-distance dating relationship prior to getting married. We lived a little over two hours apart. So for my birthday, I was going to drive down to Lafayette for the weekend. Initially, everything worked out perfectly. Our five kids were all going to be off visiting with their other parents. I took that Friday off work so that I could go get a pedicure and relax at home before heading off for a weekend of celebrating in the early afternoon. But then, all of my great plans began to fall apart. First of all, a sweet friend called me, in the midst of a personal crisis. I knew that God would rather me spend time with her instead of having my feet pampered. So, instead of soaking my feet in a soothing bath, I found myself sitting in her kitchen, listening as she wept. Before I knew what I was doing, I gave her my time slot at the salon for the pedicure appointment. I even went to sit with her while she got her feet soaked and massaged and pampered. Right about the time my friend’s pedicure was wrapping up, my cell phone rang. It was the school, calling to inform me that one of my children fell down in the mud on the playground and needed a fresh change of clothes. I dashed home to grab a clean school uniform, and then raced back to the school before returning back home to put the muddy clothes on to wash.
By this time, my day was getting away from me. So much for relaxing at home after a nice pedicure! I had to pack bags and get things ready to leave so that I could head out of town just as soon as I picked up the children from school. Of course, this was the moment that my ex-husband texted me to say he couldn’t get the kids at the appointed time and would be about an hour and a half late. Eventually, the kids were picked up by their dad and I finally embarked … only to hit traffic at every turn. I had hoped to have time to rest and slowly dress for dinner once I got to my hotel, but now I was going to be much later than I planned. Tired and frustrated, I was a big ball of emotions as I drove away for what I had hoped would be an enjoyable weekend of birthday celebrations. I hadn’t yet gotten to Lafayette when my cell phone rang. It was Jon, calling to check in and see if I was ready. “I’m not even in town yet, much less at my hotel,” I grumbled. We agreed that Jon would give me half an hour from the time I texted him with my room number. Now so far, this doesn’t seem like a very great date … and it wasn’t! But truthfully, the date hadn’t even started yet. The good news is that once the dated finally got started, everything went better. Much better. In fact, it turned out to be quite enjoyable and very memorable … definitely one of my favorites. When I got to the hotel to check-in, the room I had originally reserved wasn’t available. Somehow my reservations had gotten screwed up, but thankfully the hotel manager fixed the problem. Instead of getting a standard hotel room, I was upgraded to a King Suite, at no extra charge. As I opened the door to my suite, I was welcomed by this beautiful room, filled with flowers and a scent so wonderful I thought I must have walked into heaven. (To this day I have never been a place that smelled quite so lovely! I realize that seems like a strange thing to say, but to me the scent seemed almost God-given … like a sweet reminder that “every good and perfect gift comes from above.” James 1:17) There was chocolate on the bed and a big jacuzzi tub in the over-sized bathroom. As I stood and looked around me, I suddenly felt pampered and spoiled in a way no pedicure had ever made me feel before. Half an hour later, there was a knock on the door. I opened it to find my handsome beau waiting there, flowers in hand. Jon took me to eat at a nice restaurant, where we dined on shrimp étouffée and had pecan pie for dessert. Afterwards, we enjoyed strolling hand-in-hand and chatting before Jon dropped me back off at my hotel. 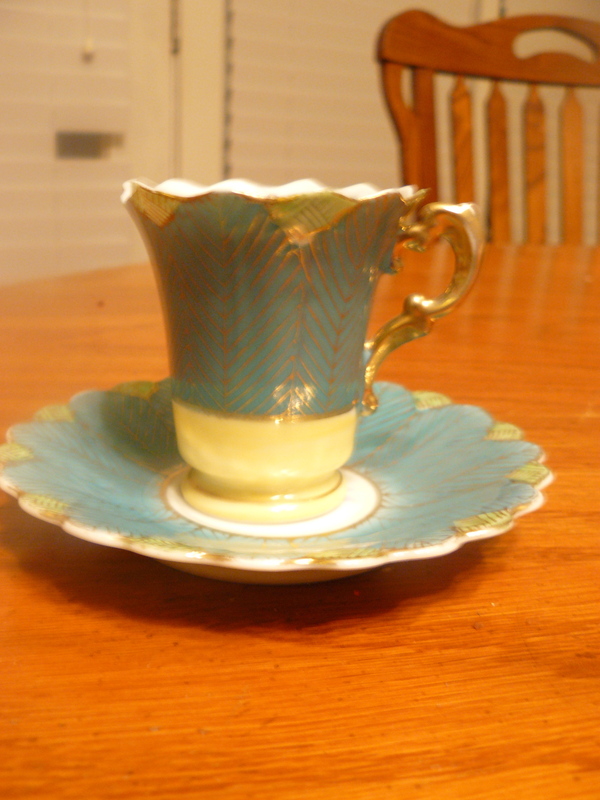 In the very first shop, I spotted an emerald green teacup with gold trim. It’s unique shape gave it something of a look of a flower with long petals unfurling. I was attracted to the bright, beautiful colors and gently scalloped edges. But when I picked it up, I noticed the beautiful cup had a chip. I hardly thought it was worth spending $15 on a chipped teacup. Look carefully on the left side of the rim and you can see the chipped place. I must have looked at another hundred or so teacups that morning. Jon and I wandered through seven or eight little antique shops, each of which had many teacups lining the shelves. Nothing compared in color or style to that little green teacup with the chip. I paused to pick up a fancy teacup, feeling tired of looking for something as beautiful as the teacup I had seen earlier in the morning, yet didn’t have a chip or a crack. “I liked that emerald green teacup a lot, too.” Jon’s words echoed my thoughts. “I know … but it was chipped. I just hate to spend the money on a cup that’s probably not worth it, even if I do like it.” I sighed, as I fingered the handle on the delicate white teacup before me, a perfect piece without a single blemish, yet not nearly as enchanting as the chipped cup back at the first antique shop. So we went back to the store where we started, and Jon paid $15 for a stunning emerald teacup with gold trim and a chipped place on the rim. To this day, that teacup has a place of honor in my collection, always on display because it reminds me that despite all my flaws Christ esteemed me worthy enough to die on the cross that I might gain everlasting life with Him. As promised, tomorrow I will share Part One of The Great Birthday Date. This is “Judge’s Contribution” to my Great Dates Contest/Give-Away. It will not be included among the entries, but will hopefully inspire my blog readers to continue submitting their own great dates stories as well as provide me with more blogging material. Besides, who doesn’t love to hear a great date story?! Want to enter the contest? Just leave me a comment about one of your great dates … or better yet, post a great date story on your blog (be sure to ping back to me!). It’s all you have to do! Just be sure to enter before the end of August. So true. It’s all so real since we are flawed creatures. I love His plans!! Have a great afternoon/ evening!!! Great post and great date. I also recall the teacup with fondness. It was something of a manly teacup I think (grin)! I look forward to the next post as I can’t recall the story for some reason – forgetfulness has it’s advantages fortunately!!!! And yes you are still worth it!!! !